Chef Thomas Kammeier of the Michelin-star, 18 GaultMillau rated HUGOS Restaurant at the InterContinental Berlin provides a taste of Germany with his delectable 4-course menu. I met with Chef Thomas Kammeier after having dinner at his restaurant, Hugos, in March 2008, where we discussed among many things, the changing Berlin culinary scene over the past 12 years, and the bond between the "10 Michelin brothers" (Thomas Kammier, Matthias Buccholz, Kolja Kleeberg, Christian Lohse, Tim Raue, Michael Kempf, Bobby Brauer, Thomas Neeser, Michael Hoffman, Thomas Kellerman), which he feels increases business for all of the restaurants. Chef Kammeier has an enviable position in Berlin creating an intriguing menu high above the city of Berlin on the 18th floor of the InterContinental Berlin, where guests have a stunning panoramic view of the city to pair with his luscious cuisine. He enjoys traveling, and two years ago, he and his wife took a driving vacation touring Italy and Austria, and of course, spent time looking at the hotel and restaurant scene. Besides cooking and creating new recipes with an Asian flair for Hugos and spending time with his wife and 18-month old daughter, Helene Marie, he has also found time to write his second cookbook, Thomas Kammeier The Cookbook. 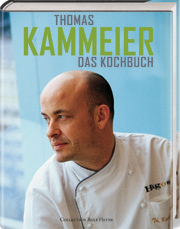 After receiving requests for an English version of first cookbook, his new cookbook is available in both English and German. 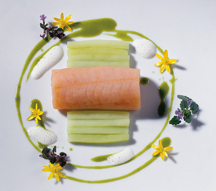 This elegant 4-course menu with recommended wines is from Thomas Kammeier The Cookbook. Method: Bring a large pot of water to the boil and add the chamomile teabag. Tie the two lobsters together at the tail and hold tem in the water so that their heads and pincers are covered. Cook for 2 minutes. Then plunge into the water and cook for a further 3 minutes. Allow to cool, break out the pincers, and cut the tail meat into thin slices. Method: Chop the pincer meat to a fine tartar and season with the crème fraîche, the chives, juice of the lime, salt and piment d'espelette. Method: Peel and fillet the oranges. Caramelize the sugar in a pot, quench with the orange juice. Add the vanilla pod and the star anise and reduce to 100 ml (3.4 ounces). Thicken the caramel with some cornstarch, add the orange fillets to it and allow to cool. Method: Heat the orange juice with the saffron and reduce to 125 ml (4.2 ounces). Mix the milk, cream and glucose together and bring to the boil. Beat the eggs together with the sugar in a Bain Marie and slowly add the milk and cream mixture until it starts to thicken and leaves a trail. Stir in the mascarpone and the orange-saffron juice and season the whole with the piment d'espelette and some salt. Allow the cream to cool and freeze in the ice cream maker. 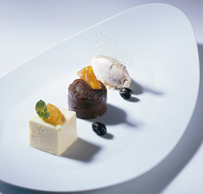 To serve: Arrange the ice cream on plates with the blood orange fillets, the lobster tail meat and the lobster tartar. Recommended Wine: White Burgundy, Spätlese Dry, Vineyard Pawis, Saale-Unstrut. Method: Trim the fillets carefully, cut into thin slices and season with salt and piment d'espelette. Roll up the fillets, drizzle with olive oil and wrap tightly in the aluminum foil. Steam the rolls for about 9 minutes at 50° C (122° F) in a convection oven or a steamer. Method: Chop the shallot into fine cubes. Peel and dice the cucumber (do not remove the seeds). Glaze the shallots in a little olive oil. Add the cucumber cubes and the wasabi paste, cover with the poultry stock. Bring to the boil, add seasoning to taste and puree. Strain through a fine sieve and color green with the leek paste. Method: Peel the cucumbers and cut into little bars. Finely dice the shallot. Chop the ginger very fine and sauté in butter together with the diced shallot. Next add the poultry stock, then the cucumbers and the wasabi paste, season and cook until soft. Method: Mix all ingredients together to make a dressing. Method: Marinate the herbs in the Asian dressing. To serve: Place the bars of cucumber precisely next to one another on the plates, set the Bavarian Char between them and decorate with the sauces and the herbs. Recommended Wine: 2005 Chenin Blanc, MAN Vintners, Stellenbosch. Method: Trim the sinews from the piece of beef shoulder, brown in some oil and lift out of the roasting tin. Put in the carrots, celeriac, and the shallots, and roast until golden brown. Next add the leek, the garlic, and the tomatoes, and continue to fry gently. Pour in the port and the wine gradually. Put the spices in a muslin bag and add to the pan, put the meat back in and cover with the veal stock. Cover and cook in a preheated oven at 120° C (250° F) for 4-5 hours. Take the meat out of the roasting tin, strain the sauce and reduce it somewhat. When the meat is relaxed, cut into pieces. Method: Cut the truffles into pieces. Heat the butter in a saucepan, add the chopped truffles and sweat them lightly. Quench with the Madeira, pour in the truffle stock and reduce. Season with the red wine vinegar. Method: Wash and cut up the carrots and parsnips. Cook in salt water with the bay leaf until they still have a bit of bite. Pour off the water. Heat the butter in a pan and glaze the vegetables in it. Add the truffle stock and reduce. The pour in the poultry stock and emulsify the broth. 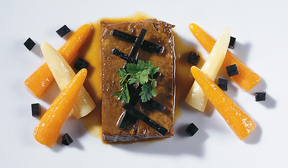 To serve: Spoon the truffle sauce over the meat and serve together with the root vegetables. Method: Melt the white chocolate with the olive oil in a Bain Marie. Soak the gelatin in cold water. Over a low heat whisk 80 grams (2.8 ounces) of the sugar with the egg yolk in a Bain Marie. Stir in the gelatin and slowly add the valrhona and olive oil mixture. Beat the egg white until it forms stiff peaks and fold into the mixture. Whip the cream to stiff peaks also and fold in. Set the mousse in a cool plate. Method: Let the chocolate coating melt in a warm Bain Marie with the olive oil and the butter. Over a low heat, beat the egg, the egg yolk, and the sugar in a Bain Marie. Slowly stir in the chocolate-butter-oil mixture, sieve the flour and carefully fold in. bake in a preheated oven at 180 - 200° C (356 - 392° F) for about 6 minutes. Turn out onto a rack as soon as it comes out of the oven. Method: Put the sugar in the water and bring to a boil, simmer the olives in it for about 30 minutes. Marinate the olives in the liquid for a day. Bring the milk, the cream, the powdered milk, the butter, and the glucose, to the boil. Beat the egg yolks, the sugar, and the modified starch in a warm Bain Marie. Add the milk mixture and simmer until it begins to thicken and leaves a trail. Allow the cream to cool and freeze in the ice cream maker. Finely chop the marinated olives and add to the ice cream together with the olive oil shortly before the end of the freezing time. To serve: Arrange the cake, the mousse, and the ice cream decoratively on plates. Recommended Wine: 2002 Domaine la Tour Vieille, Blanc Doux, Banyuls. 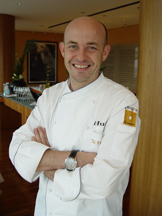 Read other articles on HUGOS Restaurant and the InterContinental Berlin in the Destinations, Hotels and Resorts, Restaurants, Chefs' Recipes (in German), and Luxury Products sections. Read other articles on Germany in the Destinations, Hotels and Resorts, Spas, Restaurants, Chefs' Recipes, and Performances sections. For information on Berlin and Germany, please visit the websites, www.Berlin-Tourist-Information.com and www.ComeToGermany.com. © June 2008. Luxury Experience. www.LuxuryExperience.com All rights reserved.